The download of the [Update_CAMAS15V300.dmg] file will start. Double-click the [Update_CAMAS15V300.dmg] file you downloaded. Do not connect the camera at this point. 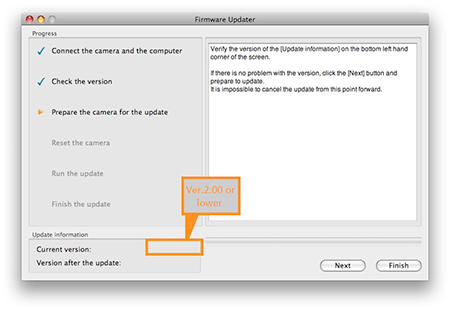 After confirming [Current version] is [Ver.2.00] or lower, clickNext. Press the [ENTER] button to execute the reset of the camera.